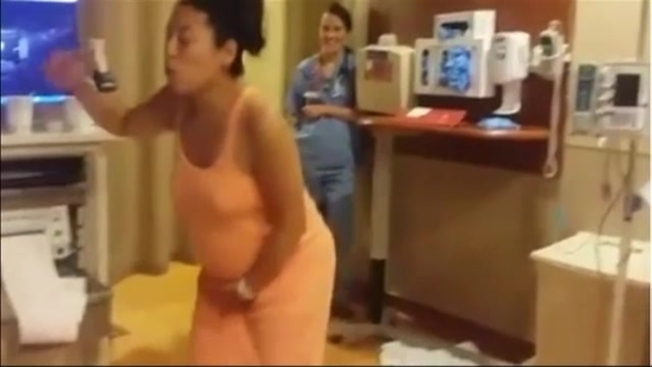 A woman with fantastic dance moves took to the song "Tootsee Roll" to alleviate her labor pains. Yuki Nishizawa of Boston, Massachusetts, put on a little show at Brigham and Women's Hospital just before the birth of her son. Yuki and the baby's father Connell Cloyd welcomed Coji Nishizawa-Cloyd into the world around 1:30 a.m. on Aug. 19. "She's the best dancer! And, it worked," Connell told necn. He originally posted the video clip on his Facebook page. Click here to watch the original "Tootsee Roll" video by 69 Boyz. We don't think they have anything on Yuki. We're sending best wishes to the entire family, whose labor video has become a social media phenomenon.